TOCWOC’s Take: The 18th North Carolina, the subject of this new regimental history, is best known for having fired the volley which wounded Stonewall Jackson and led to his death. What is overlooked is that this regiment was with the Army of Northern Virginia for most of the war and did good service throughout. The author, James Gillispie, also authored Andersonvilles of the North: The Myths and Realities of Northern Treatment of Civil War Confederate Prisoners. I read and reviewed that book and found it to be very well done. In briefly glancing through this book, however, I see very few illustrations and absolutely no maps, unacceptable for this type of book. Combine this with a $35.00 price for a paperback and this one is going to be attractive to a very limited audience, probably collectors of regimental histories and those with an interest in this particular regiment. The 18th North Carolina Regiment has the dubious distinction of firing the volley at Chancellorsville, Virginia, that mortally wounded General Thomas “Stonewall” Jackson. This tragic accident has overshadowed the regiment’s otherwise valiant service during the Civil War. One of Robert E. Lee’s “fighting regiments,” the 18th North Carolina was a part of two famous Confederate military machines, A.P. Hill’s Light Division and Jackson’s foot cavalry. 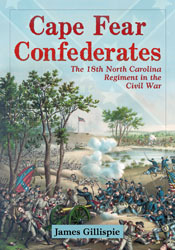 This revealing history chronicles the regiment’s exploits from its origins through combat with the Army of Northern Virginia at Hanover Court House, the Seven Days’ Battles, Cold Harbor, Petersburg, and other battles to its surrender at Appomattox Court House as a battered, much smaller shell of its former self. A roster of those surrendering officers and enlisted men and brief biographical sketches of those who fought with the regiment for most of the war complete this enlightening account. James M. Gillispie is the division chair of Arts & Sciences at Sampson Community College in Clinton, North Carolina, where he has taught since 1999. He is the author of one other book on the Civil War and has been a featured speaker at the Museum of the Confederacy in Richmond, Virginia. TOCWOC’s Take: The author is a former journalist and now an emeritus associate professor of journalism a the University of Florida, so the odds are good that this book will be well written. The author draws heavily on eyewitness accounts to help fill out the narrative. Browsing quickly through the notes and bibliography, the author relies heavily on first person accounts written after the war by famous individuals. The Official Records are noted in the bibliography, but I saw only one or two references to it in the notes. It looks like this book is aimed at a popular audience and written in that style. The goal is to tell what is a fascinating story, but the author does not seek to tread any new ground. 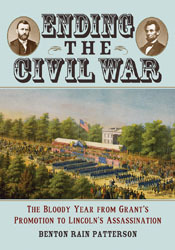 Dramatically and authentically, using eyewitness accounts where possible, this book recounts the final 13 months of the Civil War, a year in which a new U.S. Army general in chief was appointed, a new course for the war was charted, a massive new campaign was begun, the abolition of slavery was confirmed by the re-election of Abraham Lincoln, and the course of history was altered by the assassination of America’s most revered president. It was the year that the United States won the final battle and the year that the sundered nation was reunited. The book describes those events and the key figures in them.